Some have noticed a pattern between Toyota sudden acceleration cases and the age of drivers. We did too, so we updated their numbers and turned them into a pretty chart. We like pretty charts. Updated! Commenters noted that we could actually make this chart useful if we provided some context. Fine, we did. 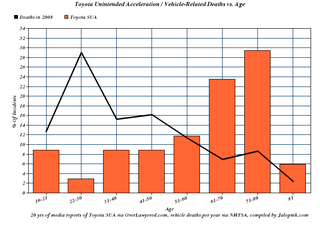 We changed the values of Toyota sudden unintended acceleration over the past 20 years to percentages, and added a black line illustrating the # of road deaths in 2008 per age group — to give you an idea of the # of deaths normally attributed to driving. Does anyone else see the pattern now? Also, I got the x- and y-axis correct this time.